Nani’s Krishna Gaadi Veera Prema Gaadha Movie has hit the big-screens today with good expectation. Will Nani be able to score another hit after Bhala Bhale Magadivoy. 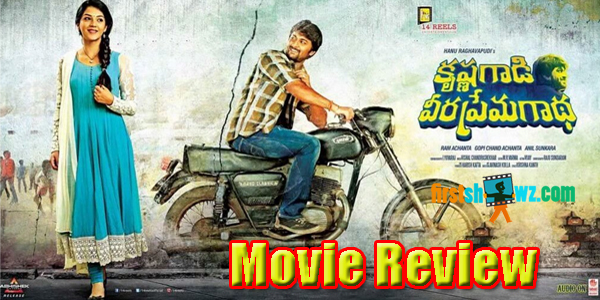 Here is Krishna Gaadi Veera Prema Gaadha Movie Review. Nani and Mehreen played the lead roles in this Hanu Raghavapudi directorial while Anil Sunkara, Ram Achanta and Gopichand Achanta produced it under 14 Reels Entertainment banner. Vishal Chandrasekhar is the music director. Nani's vintage look and the teasers and trailers have garnered very good response raising the expectations on the movie. Krishna Gaadi Veera Prema Gaadha Movie is all about a love story laced with emotions set in Rayalaseema backdrop. Stick to this space for Nani's Krishna Gaadi Veera Prema Gaadha Movie Review on firstshowz.com that will be updated in a while. Nani is very natural and delivers an all-round performance and he is a treat to watch. His comic timing is exceptional, dialogue-diction is impressive and he carries off the role with ease. New girl Mehreen bags a good role. She looked good and performed well in the love scenes. It’s a good start for the actress in Tollywood. Mahadevan and Rama Krishna are apt for their roles. Sampath Raj as fiery cop delivers his best in his style, Murali Sharma as mafia don is impressive, while Brahmaji, Prabhas Sreenu and 30yrs Industry Prithvi are entertaining in their roles. Annapurna is note-worthy and others are adequate. Vishal Chandrasekhar’s musical scores are pleasing and so is the BGM. However, the songs in the second half could have been placed well. Cinematography is on top-notch while the dialogues are natural. Hanu Raghavapudi’s writing and direction skills are note-worthy. Storyline is promising but the screenplay could have been racier. Editing could’ve been crisp. 14 Reels Entertainment production values are rich. Krishna Gadi Veera Prema Gaadha has an interesting storyline and Hanu Raghavapudi deals in his style with unique treatment. The first half of the film is engaging with good interesting scenes between the lead pair. The director had good grip in handling the love story, and the chemistry between the lead pair is believable. Pre-interval episodes are gripping and are dealt impressively. However, it’s the dragging second half that caused the problem. The narration is much slow, and the long duration is the other added issue. At least a song could have been trimmed in the second hour. Krishna Gadi Veera Prema Gaadha- Nani does it again!